The U.S. Food and Drug Administration's (FDA) 2017 draft guidance that proposed drug-like regulatory scrutiny of food animals produced using gene editing technology such as CRISPR has global implications for the future cost and feasibility of food animal production. This regulatory proposal fails to recognize that the same genetic changes could be achieved using conventional breeding techniques instead of newer molecular methods, and does not consider whether or not the changes are novel or present any hazards, as is clearly explained in a timely and insightful commentary published in The CRISPR Journal. In "The Importance of a Novel Product Risk-Based Trigger for Gene-Editing Regulation in Food Animal Species," Alison Van Eenennaam, University of California, Davis, cautions against making the regulatory process unnecessarily burdensome for using gene editing to make targeted changes that may be identical to existing genetic variants or might occur spontaneously. The use of gene editing tools accelerates the benefits that can be achieved with conventional animal breeding. Imposing a new drug-like regulatory framework on food animal production could prevent animal breeders from using gene editing to introduce beneficial traits such as disease resistance. Dr. Eenennaam suggests some alternative routes to regulatory approval that are in use in other countries. 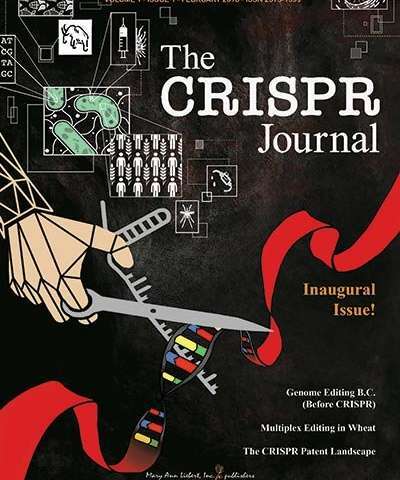 "Now is the time to opine on questions that need to be addressed in regard to how CRISPR-based technologies should be implemented and regulated," says Rodolphe Barrangou, PhD, North Carolina State University, Raleigh and Editor-in-Chief of The CRISPR Journal. "Though much of the attention is on human therapeutics, efforts already underway in livestock breeding compel us to cover this."